Kazakhstan: Zhanar Sekerbaeva, prominent LGBT activist from Kazakhstan and co-founder of feminist initiative Feminita, based in Almaty, was detained on Wednesday, August 14, 2018. 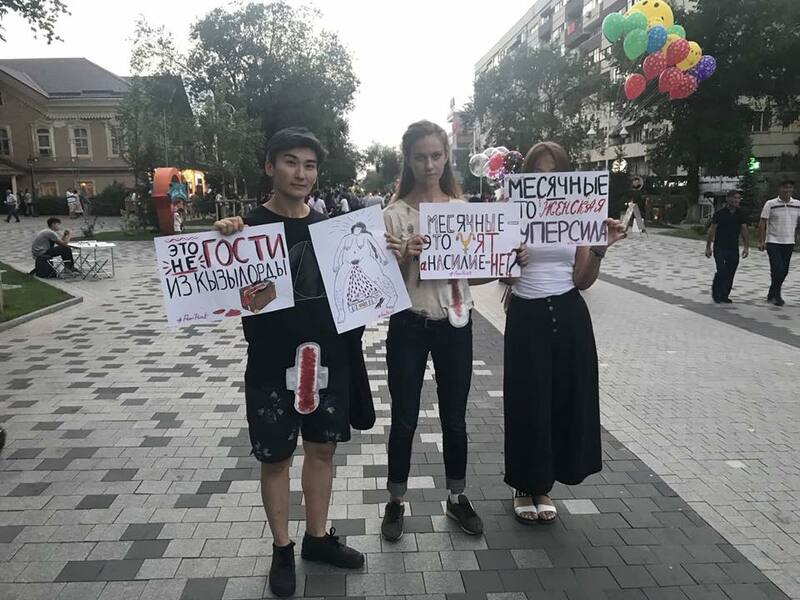 According to Feminita, Zhanar, together with Elena Ivanova, Alina Nevidimko and Polina Pollinium, organized photo session at Arbat street in Almaty on August 9th, 2018, dedicated to de-stigmatization of menstruation that attracted a lot of attention both online and during the session itself. Despite that the photo session was peaceful, it was interrupted by men, who pulled out posters in aggressive manner and threatened to take away mobile phone from one of the participant. The participants decided to leave the venue since they did not want to become witnesses of the violence. On August 15th, Zhanar was forcibly detained by the Department of Internal Affairs of Almalinsky district, represented by seven policemen. According to Zhanar, the subpoena was written by Major Elyubaev right before the detention. Earlier, the subpoena was delivered to another co-founder of the ”Feminita” Gulzada Serzhan. According to Gulzada, the police “handed the subpoena and asked me to come for “preventive conversation ”because feminists are organizing actions in their district”. Gulzada also wrote on her facebook page that even though she is a feminist, she did not organize any actions (photo session) in their district. Kok.team, Kazakhstan’s resource that aims to form LGBT community in Kazakhstan, claims that “there are basis to believe that Zhanar Sekerbaeva and Gulzada Serzhan were summoned by the Department of Internal Affairs of Almalinsky district because they come from ”Feminita” that works with lesbian, bisexual and queer women. Yevgeny Zhovtis, director of Kazakhstan’s International Bureau for Human Rights and the Rule of Law, claims that the subpoena is illegal. It does not comply with the rules of issue. On August 15th, at around 21:20 Zhanar was released from the Department of Internal Affairs. Initially, the hearing was scheduled to be held on August 17th, but it was rescheduled and is planned to take place on Monday, August 20th, 2018. The case is related to the photo session that aimed at de-stigmatization of menstruation. An administrative case was filed under the article of ”Minor hooliganism” and it was initiated by two witnesses. Despite the many noncompliances with procedural codex, Zhanar plans to be present at trial on Monday, 20th of August.